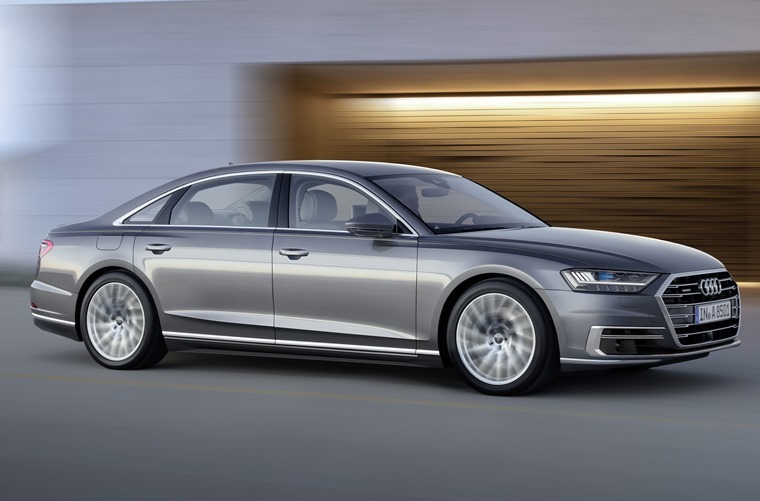 Audi has officially unveiled its all-new A8 flagship saloon ahead of its public debut at the Frankfurt Motor Show later this year. With autonomous tech and hybrid drivetrains, it will take the fight to the upcoming Mercedes S Class as well as BMW’s latest 7 Series. 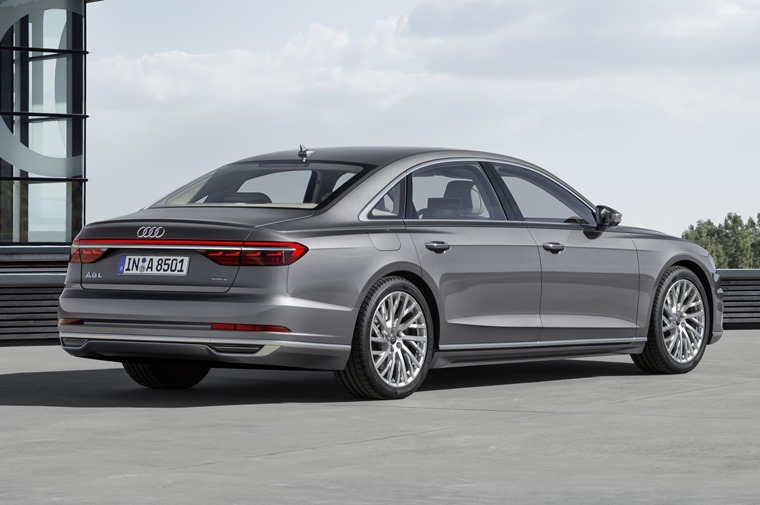 Sitting on an all-new platform, both the standard and long-wheelbase versions of the A8 are marginally (37mm) longer than its predecessor, and it gets Audi’s latest bold look in terms of design. At the front the grille is wider, while more angular headlights and sharper lines bring its appearance right up to date. At the back, an all-new set of tail lights wrap around the boot, with what is presumably the third brake light running the length of the boot lid. 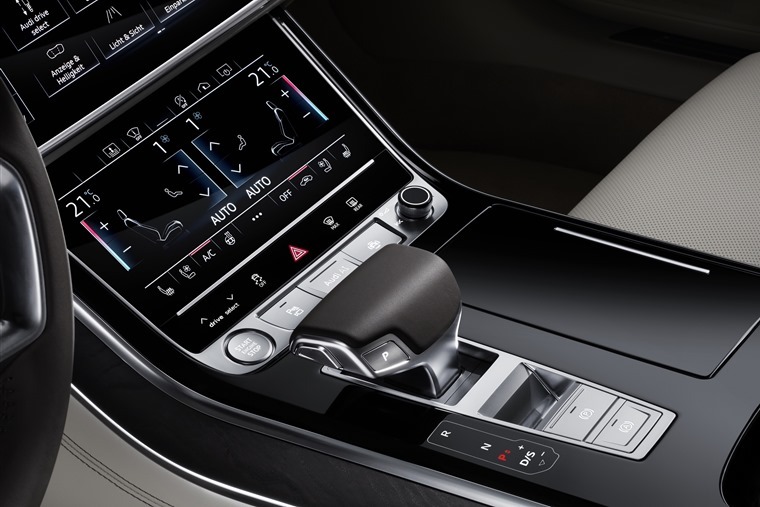 The interior is a complete redesign of the outgoing model’s, with most of the car’s functions now controlled through either the 10in infotainment system or the slightly smaller (8.6in) heating controls. 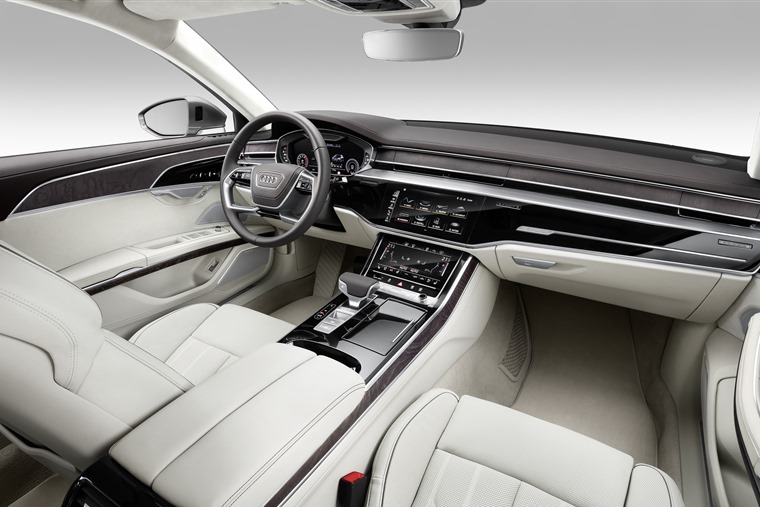 An all-new steering wheel features, while the rest of the interior is up to Audi’s impeccable standards of design and quality. It’s in the back that really matters in a car like this, and with more legroom for both the A8 and A8L, rear passengers won’t be disappointed. 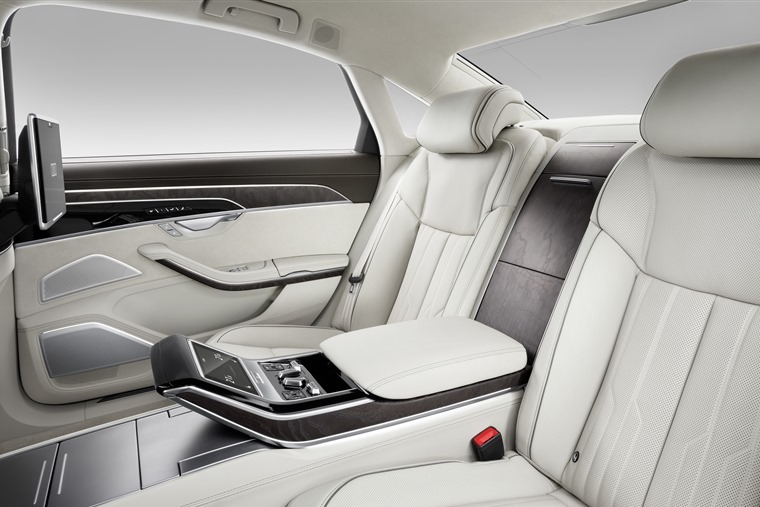 Admittedly it doesn’t look quite as opulent as an S Class, but with their own infotainment controls and a leather covering every conceivable bit of trim, this is still set to be one of the most luxurious and comfortable saloons on the market. The new A8 is a car fit for Spider Man, and as such gets autonomous tech that means that it can now essentially drive itself – up to 37.3mph at least – thanks to four 360-degree cameras and 12 radar sensors – watch out Tesla! 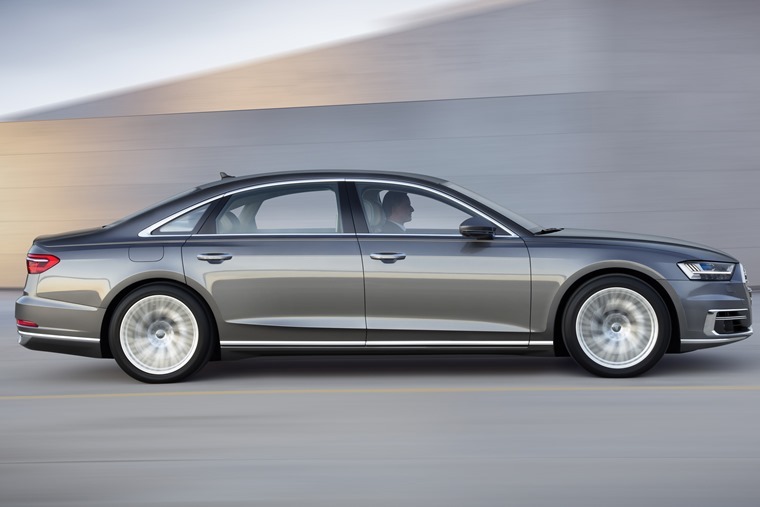 In fact, unlike Tesla’s Autopilot system, you don’t need to monitor what’s going on in the same way; Audi claims the A8 will be capable of level 3 autonomy by 2019 , provided legislation doesn’t get in the way. If you do fancy taking the wheel though, a range of new hybrid engines are on offer, kicking off with petrol and diesel 3.0-litre V6s which produce 339bhp and 285bhp respectively. Those that want more cylinders can choose between two V8s – one petrol and one diesel – producing 459bhp and 434bhp. All these powertrains make use of a 48v mild-hybrid system too, which allows the engine to coast and results in a boost of around 2.5mpg across the range. It’s all thanks to a lithium-ion battery in the luggage compartment to act as the energy accumulator for the MHEV (mild hybrid electric vehicle) with a 10 Ah charge carrier capacity and a 48V system. Aside from the mild-hybrid system, a further model is in the works too, which will pair up an electric motor and the 3.0-litre V6 petrol engine. That raises power figures to 448bhp, and means a rather un-saloon-like 0-62mph time of just 4.9 seconds. We’ll have to wait until Frankfurt to find out further tech details and a full specification list, but it’s expected to hit the UK in the autumn and get a list price in the region of £70,000. Would you choose the new A8 over the upcoming S Class?